During our recent stay at the fascinating riverside city of Kuching in Sarawak, Malaysia, we packed these three activities into one day when Ivy Chin, proprietor of Borneo Trek and Kayak Adventure, graciously offered us her most popular excursion. Our bus picked us up early and we headed out of town, escaping the incoming traffic jams that snarled the intersections into Kuching. Soon our van was climbing into the foothills of the Borneo Highlands while our excitement mounted. Our first stop was at the Semengoh Wildlife Center, renowned for its friendly Orangutans. After a brief walk down a sealed road we paused at the forest’s edge, along with a dozen other visitors, hoping that we’d see these fascinating apes. Waiting silently, we could hear crashing and grunting among the tall trees in the distance. Soon several Orangutans swung into sight along the wildly waving treetops. A trio of orange-red Orangutans emerged cautiously from the forest, lured by the fruits spread out nearby on a raised platform. These gentle creatures appear very human-like, and looked at us with great curiosity and intelligence as they walked onto the road and up the hill. It’s easy to see why their name, translated from Indonesian, means “person of the forest.” In fact, Orangutans are considered one of the most intelligent primates, and use sophisticated tools and build elaborate sleeping nests. 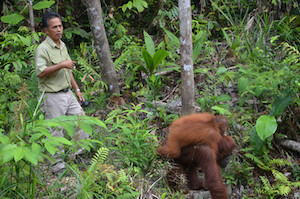 The Orangutans paused on their way up the hill to play briefly with each other. They meandered slowly through our group as we all got closer to take photographs. We were lucky to see the Orangutans walking among us on their fists, as they’re primarily tree-dwellers. Their coarse red fur is long and frizzy and their muscular outstretched arms span over two meters — longer than six and a half feet! I noticed the park ranger was always positioned between the Orangutans and us — he doesn’t want overexcited kids to get slapped or mauled by the mother Orangutan protecting her baby. The mother carries her baby on her back and it enjoys the free ride, even though it’s capable of walking alongside. The ranger explained that all of the Orangutans have names, like Roxane, Lela, Bake, Edwin, Nora, Murray, Seduku, and Analisa. The apes eventually disappeared into the dense jungle near our parking lot. We left the wildlife center reluctantly and stopped further up the roadside to examine some bulb-shaped, carnivorous pitcher plants that swallow insects whole. Some of them were eight inches long. Driving on, we entered the steep, winding Penrissen Mountain Range, where I learned it’s actually possible for hikers to walk. I’m from the Pacific Northwest and used to easy going through marked trails and undergrowth, and I simply can’t imagine bush-crashing through this impenetrable terrain. 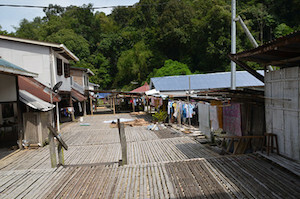 We drove across a Bailey bridge to the Kampung (village) Annah Rais Longhouse, a village on stilts where 80 households of mountain natives dwell (600 people in all). After an introductory talk about tribal life we climbed up some steep stairs to the longhouse proper and walked gingerly along the bamboo-covered Awah, the lengthy veranda-like walkway. We were walking through a village built on thick hardwood stilts. The bamboo slats creaked and sagged as we stepped on them, but then sprang back — they’re safe to walk on. We ambled along the wide central bamboo “street” past large mats of berries and rice spread out to dry in the hot sun. Sleepy village cats are draped along the bamboo floor. Faded clothes hang from thin bamboo clotheslines. Satellite dishes are fixed precariously above some of the houses. Most houses have corrugated tin roofs in various states of disrepair, their wooden sidings bleached out and weather-beaten. A few lush green branches poke through spaces beside the houses. Old ladies behind small stands offered us samples of Rambutan and other tropical fruits. Most of the young villagers, I was told, live in the cities where they can find jobs. They return on weekends or for special festivals. 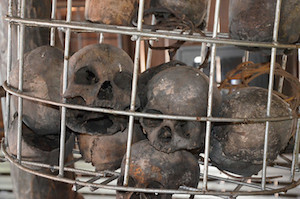 Entering the village’s ceremonial house we saw a large cylindrical metal cage filled with a dozen blackened skulls, relics of the village’s former headhunting days. Other bamboo pathways branch off left and right, lined with more houses. It’s a sizeable village! Our longhouse tour ended, we crossed back over the river and headed off for lunch. 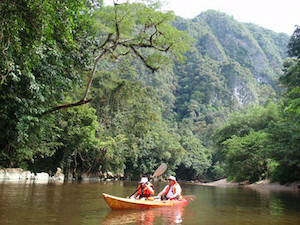 Then it was time to cool off with some kayaking down the Sarawak River. Kitted up in life jackets, we boarded our fiberglass two-person kayaks and paddled gently down the river. The river is a muddy brown ribbon carved out of the dense, lush jungle. Huge branches and leaves stick out over the water, tangling with paddles. We paddled seven miles altogether, with several breaks. We kayaked into large limestone caverns carved into the riverbank and under spectacular granite formations that overshadowed us. There’s a photo opportunity around every bend. We passed several wooden canoes with local village kids fishing or just plain goofing off, taking dips in the cool water. I watched jealously and decided that life isn’t bad for a Kampung boy! The current is slow, so we weren’t drifting downriver very quickly. We had to paddle. There are only two small rapids along the river that we handled like professional Olympic kayakers (sort of). Along the way we stopped and walked up a narrow side stream in our aqua socks, knee deep in places, to our own small, private waterfall — the water is freezing, but refreshing on that hot and humid day. At halfway, we visited a riverside village that cultivates medicinal and experimental plants for harvesting and research. I saw a Mexican oregano plant called Hati Hati that is used for coughs, constipation, and flavoring — the Malaysian equivalent of one-stop shopping. Another tuber plant, called Keladi Tikus, is used for anti-cancer research. Continuing our paddle downriver we constantly had “wow” moments as we saw magnificent tall limestone pinnacles rising up from the jungle, forming a spine of rugged mountains alongside the river. We ended at another small kampung, washed off, boarded the van, and promptly fell asleep on our drive back to Kuching. It had been a long day but one of my most memorable travel days ever. Borneo should be at the top of every traveler’s list. This is one of the best value day tours I’ve ever been on. Great guide, plenty of interesting activities, and a nice kayaking trip down the river.